Want to know more about gambling in Perth? The city of Perth has a good gambling scene but some peculiarities when it comes to where you can partake in some popular activities. Did you know that the only place in Western Australia where you can play Keno or the pokies is in Perth’s casino? In this guide, we take a look at the ways in which you can wager and gamble in Perth including poker, casinos and race courses. Gambling in Perth is regulated by the Department of Racing, Gaming and Liquor under the Gaming and Wagering Commission. Perth has a great range of gambling opportunities including winter racing at Belmont. Image via Wikimedia. As well as federal laws, the commission also govern compliance with several specific state laws but, as long as you over the age of 18 and your gambling activities are undertaken with a licensed bookmaker, at a venue with a current and valid license then gambling in Perth is legal. With 1.671 million people, the state capital of Perth is home to 65% of Western Australia’s population. The city also plays host to between 8 and 10 million visitors each year making it a hub for many leisure activities, including gambling. Perth offers a variety of ways to gamble including a city casino which holds the states only licenses for playing pokies and keno. The city enjoys several race courses including greyhounds, thoroughbreds and harness racing. Perth also has venues that offer bingo as well as poker, plus you can enjoy televised sports and race betting through the social clubs and sports bar TAB network. As a city, the residents of Perth spend more money at the casino than on any other form of gambling with an estimated $1,849 per person being gambled at The Crown each year. Given that the casino is the only place in the state of Western Australia where electronic gaming is licensed, this isn’t surprising. The Crown Casino is the only place in WA where you can play the pokies. Image via Crown Casino. The second most popular way to gamble is wagering on races followed by the Lotto and then sports betting. Minor gaming, scratch cards and the pools all have low turnovers. Overall, the gambling expenditure per capita in Western Australia is quite low and the state has the lowest rate in the country (with the exception of Tasmania) at $3,390. The average annual gambling spend per person in the country is $10,481. Compare this to the Northern Territories where this figure reaches an incredible $65,585! 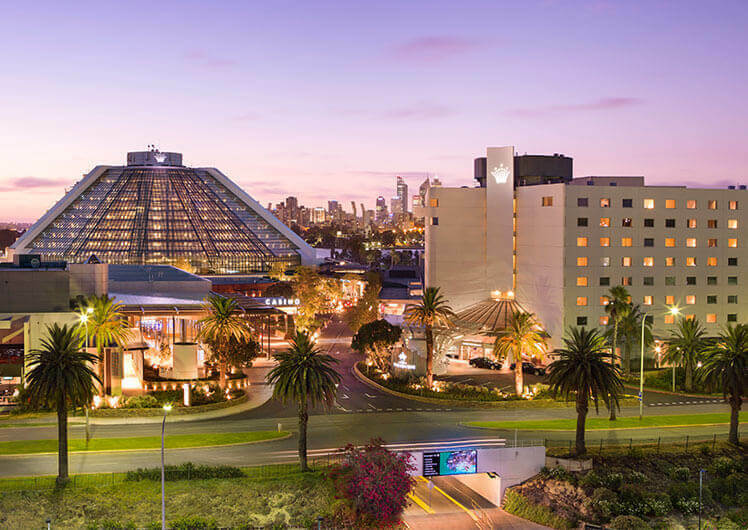 As with all of Australia’s major cities, just one license for a casino has been granted for Perth which is held by the Burswood Entertainment Group. Currently, the company operates the only license for the territory of Western Australia. Once the largest casino in Oz, the Crown has spent $750 million in renovations. Image via website. Originally opened in 1985, the Crown Casino and its surrounding complex has been renovated in 1990, 1999, 2002 and 2012. The site incorporates a convention centre, hotel and theatre along with nightclub and other leisure facilities. Situated just a few minutes across the Swan River from central Perth, the design of the building makes it look like a futuristic Aztec temple. Costing $200 million to build when it first opened, Crown Perth was the largest casino in Australia at the time and the third largest in the world. Though this title has now been taken by the company’s sister site in Melbourne, the Crown is still a huge place to enjoy a night of gambling. The casino enjoys the only license for Keno and EGM play in all of Western Australia as well as offering poker and table gaming. 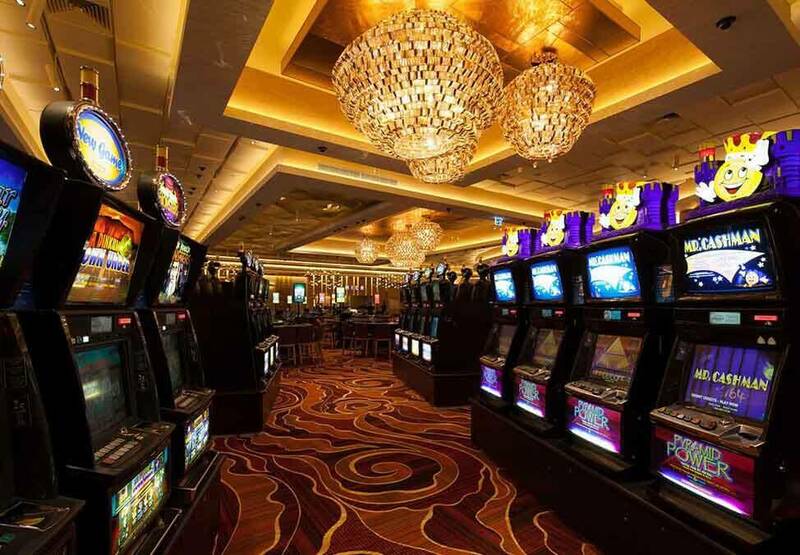 There are several dedicated lounges and bars to entertain sports fans, baccarat players and pokie gamblers. In addition, there is also a members lounge plus the famous Pearl Room for VIP gaming. The Crown Casino is open 24 hours a day, seven days a week. The details of all WA meetings and events are published annually by the Racing and Wagering Western Australia association. You should note that these cover all of Western Australia but most are around the Perth area. Courses and tracks are listed below with a summary of events and facilities. Horse racing in Australia is the third most popular spectator sport behind Aussie Rules and rugby league and Perth offers a good range of venues to get in on this action. Home to summer racing in Perth, Ascot is a hard finish for ‘stayers’ only. Image via website. Originally opened in March 1848, Ascot Racecourse is the principle horse racing venue in Perth and is adjacent to the headquarters of the Perth Racing Club. Ascot is one of Australia’s oldest racecourses and hosts prestigious events such as the Perth Cup, the Kingston Town Classic and the Karrakatta Plate. A Tri-Oval course, Ascot has been refurbished to modern standards since it was first opened almost 170 years ago and features a 9.94 furlong track with one of the most severe tests of stayers in the country; a 300m inclining home straight. Racing is screened on the Seven Network but you can use TAB facilities on site if you attend on race days. Meets are held on Wednesday and Saturday during the summer racing season. Perth’s second racecourse, Belmont Park is a flat course and has been showcasing thoroughbred racing since 1910. Considered one of the best winter tracks in the country, the course is situated just 10 minutes outside of the CBD and a stone’s throw from the city’s casino complex, The Crown. The course has full TAB facilities as well as dining and hospitality areas. Belmont Park picks up with Wednesday and Saturday racing during the winter months. An hour south of Perth’s CBD and you can find Pinjarra Park. Home to thoroughbred racing in the area since 1891, the racecourse is a picturesque location and hosts a selection of event day racing (see calendar for details). It’s a track where you can get up close to the action and the parade ring, grandstand and expansive lawns are all well-kept. There’s some great facilities on site including TABs, air-conditioned restaurant and fully licensed bar. Friday nights at Gloucester Park are fast-paced and full of action. Image via website. Perth’s harness racing venue, Gloucester Park is situated in the heart of Perth between the Swan River and Queen’s Gardens. There are three restaurants on site as well as a bar and lounge plus TAB facilities. Racing is held on Friday nights and the proximity of the venue to the city makes it a popular choice for nights out. You can also find Bunbury Turf Club about two hours drive south of Perth or Northam Race Club about a 90 minutes easterly drive, inland. The oldest provincial racecourse in Western Australia, York Racecourse, is not far from Northam. Reopened following a devastating freak storm which destroyed the heritage listed grandstand, York is a fast paced course and has occasional thoroughbred races throughout the year. Narrogin Race Club is WA’s only course to host both harness and thoroughbred racing and is about a two hour drive south east of Perth. Greyhound racing is still legal in Western Australia despite calls for the sport to be banned. Whilst the ACT has now agreed a ban which will be implemented from April 2018, Western Australia still enjoys a good dog racing scene. Hosting racing on Wednesday and Saturday nights, greyhound racing at Cannington is state-of-the-art. Visitors can enjoy full TAB facilities and watch the races from the upper level whilst enjoying drinks or snacks at the bar. Catch the dogs in action at any of the three WAGRA sites around Perth. Image via WAGRA. An hour south of Perth is the Mandurah greyhound racing track at Kanyana Park. A TABtouch venue, you can find the usual facilities on site including gaming tables and free entertainment. Kanyana is a modern venue with SKY Racing and TAB radio. Racing on Tuesday and Thursday is free with Friday evenings costing $6 admission. About 100km east of Perth and you can hit the Avon Valley dogs which holds races on a Monday afternoon. Admission is free and the venue has full dining, bar and TAB facilities on site. Established in 1932, the lottery in Western Australia is run by Lotterywest. The organisation is the only remaining state owned lottery in Australia. Whilst much of the games are associated with the national OzLotto, you can also purchase games which are unique to Western Australia including the local Cash 3 game. Drawn every night and broadcast on Channel Seven or GWN, the game has a jackpot of $500. Life-changing jackpots are available on Monday, Wednesday and Saturday night draws or the ‘Set For Life’ draw. Tickets can be purchased online or at any of the Lotterywest retailers. In Western Australia, you can only play Keno at the Crown Casino. There are two varieties you can participate in; electronic and coin operated. The casino has a dedicated Keno lounger which is situated next to the Carbon Sports Bar or there are self-serve terminals around the gaming floor. The Crown Casino is now hosting a poker tournament of its own as well as weekly Monday night games. You can follow Crown Poker on Facebook to stay updated on all champs, games and events. There are poker events played across Perth in the form of tournaments, leagues and cash games. These are run by a variety of leagues including the World Poker Tour League (WPT), Wynners Poker League (WPL), Australian Poker League (APL) and Perth Poker League (PPP). The Wynners Poker League plays at The Game sports bar every Friday night. Image via Wynners Poker League. Both 75 and 90 ball bingo are popular forms of leisure gambling in Perth and not just in the senior citizen communities. You can find bingo events most days of the week around Perth. Image via Flickr. The legislation in Western Australia differs from the rest of the country in that no venue, other than the state’s casino (see Crown Casino Perth, above) is licensed for electronic gaming machines. The Crown has plenty of EGMs to choose from. Image via Crown Casino, Perth. 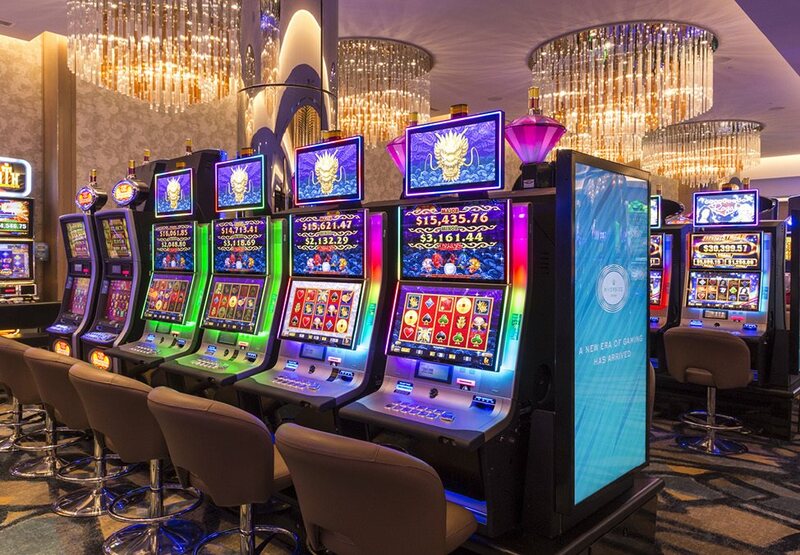 At the current time, there around 2000 licensed pokie machines registered to the Crown Casino. However, these machines have no win limits or cheque payout restrictions. The note acceptors are unlimited but have a maximum bet level set at $225. They must each be set to have a minimum RTP ratio of 90% and meet the national standards of game frequency. Bets range from 1 to $1. Note: lever operated (or pull-down) pokies are illegal in Western Australia. If you are looking to find a sports bar or social club with TAB facilities so you can settle down with a drink in good company, then Perth has plenty of venues which offer both wagering facilities as well as screening big races and sports events. You can get full TAB and watch the sports on huge plasma screens at the Crown Bar (Casino). Image via Google. Our pick of the best venues in Perth with TABs are listed below but you can also use TABtouch to find alternative agency of self-service TAB venues.